Strong bones are the foundation of a strong body! Calcium is truly essential for healthy bones and teeth, and yes, critical for the prevention of osteoporosis. * Core Cal-Mag's calcium comes from the best natural sources—pure milk and calcium carbonate. Additionally it contains no protein, lactose, or milk allergens, so it’s easy to get your daily calcium supply, even if you're not a regular milk drinker. And here’s a supplement-industry dirty secret: some calcium sources have been discovered to contain a risk of lead contamination--but not ours! 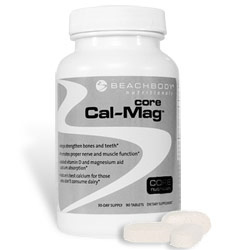 Core Cal-Mag is good for you!